Welcome to the LiteMage Showcase! This is a series of blog posts where we take a look at Magento site owners using LiteSpeed Web Server + LiteMage Cache and highlight how LiteMage has uniquely benefited them. This week we are featuring Izy Shoes, a Greece-based business specializing in women and children’s shoe sales! 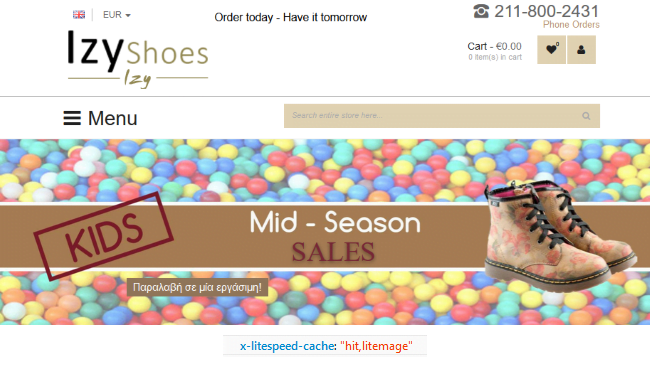 Before switching to LiteMage, Izy Shoes was using Extendware’s Full Page Cache and Cache Warmer extensions. The Cache Warmer would crawl their sites for 4 hours every cycle, using up to 99% of their plan’s allotted CPU usage and severely impacting performance. Because of this, they would crawl only once every 24 hours during low traffic periods at night. Additionally, there was no form of selective tag flushing so there was no way to automatically purge recently modified pages. This is not a big problem for changes to CMS pages but product pages would also not be updated when changes in stock or availability occurred. Either the entire cache was purged or they would have to wait until the next nightly site crawl or TTL expiration time to be (temporarily) up-to-date. Despite these limitations, it was out of the question to run the site without a full page cache as it would become far too slow. A built-in crawler for cache warmup. No need to purchase/install a separate crawling extension! Tag flushing, the ability to purge pages related to a product when a change occurs, is standard in LiteMage. Whenever a change occurs to a product, LiteMage uses tag flushing to automatically purge all related pages and categories. The updated pages are then re-added to the cache the next time they are visited, keeping your page cache up-to-date. This can be especially useful if updating data through importing. A combination of ESI hole-punching and private caching allows LiteMage to punch holes in pages where private data exists so that the majority of the page can be publicly cached while the remaining private data is cached in per-user private caches. This allows pages containing user-specific information to be assembled entirely from cache, completely avoiding Magento’s heavy backend! This significantly decreases page load time, memory usage, and CPU utilization. User-defined cache rules for a quick and easy-to-configure set up. After implementing LiteMage Cache, Izy Shoes found that they no longer experienced spikes in CPU usage when crawling, their site is now always up-to-date, and there has been an overall decrease in their CPU and memory use, all without sacrificing the speed gained by using a full page cache. As you can see in more detail in our ProperHost case study (numbers courtesy of ProperHost), Izy Shoes saw a reduction in page load times by 93.5% when compared to their site with no page caching, resulting in page load times that are 15x’s faster on average! That is an amazing increase in speed considering no changes were made to the server’s configuration after installing LiteMage.